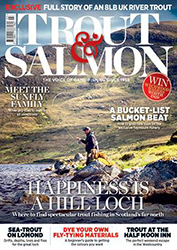 Welcome to the website of Trout and Salmon magazine - the UK's biggest game fishing magazine with inspirational photography, great fishing techniques, fly fishing tackle reviews and advice from the fishing experts. If you're serious about your game fishing, then Trout and Salmon is the one for you. Buy fishing supplies online - pay less on your car insurance!